Manchester City chairman Khaldoon Al Mubarak says the club will "strive for more" after they announced yearly revenues of 500 million pounds ($655 million) for the first time on Thursday. 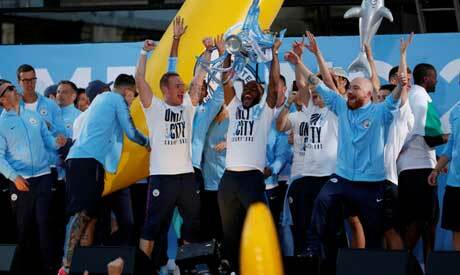 The annual report said last season's runaway Premier League champions had enjoyed revenues of 500.5 million pounds -- a 44 percent increase in five years. It also said highlighted a fourth successive profitable year -- this time 10.4 million pounds with a wage to revenue ratio at "a healthy" 52 percent. "Our aim is obviously to build on the achievements of the last year," Al Mubarak, City's chairman since the club was bought by the Abu Dhabi United Group in 2008, said in a statement. "We will always strive for more. "Our journey is not complete and we have more targets to fulfil." According to the report, City's income has increased six-fold in the past decade and they have risen from 20th to fifth in European clubs' revenues league table. The club's facilities have also been transformed with state-of-the-art training facilities. On the pitch they are also thriving with former Barcelona coach Pep Guardiola having taken City to the title last season with 100 points -- the first club to achieve that total. "Most of the developments visible today are the result of a carefully crafted strategy -- one in which organic evolution has also been allowed to thrive," Al Mubarak said. "The 2017-18 season will go down in history because of the incredible football we all witnessed. We are filled with an extraordinary sense of pride in the hard work of Pep Guardiola, the players, and the staff who work tirelessly to support them."